I have Hilton to thank for this soup. Hilton is a local farmer who has recently set up shop in our town, selling his organic vegetables to people like me who are dying to have a real farmers’ market. For $20, you bring your own bag and he fills it to the brim with produce. This week, I came home with green beans, tomatoes (red and green), a variety of sweet and hot peppers, turnips with greens, cucumbers, broccoli, oranges, spinach, butternut squash, carrots and onions. I love this method (similar to a CSA, really) because I end up getting vegetables I wouldn’t normally think to pick up (this week, that was turnips). New veggies usually lead me to new recipes- and on cool days, that means new soups. 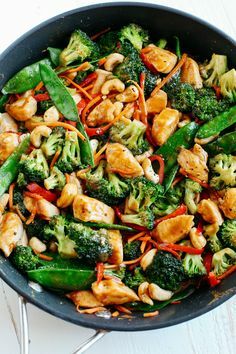 I like to use the vegetables as the center of the dish- not just the side show. The method for this soup is typical- saute some onion and herbs, add your firmer veggies with liquid and simmer for a while, then add your greens and beans and heat through. 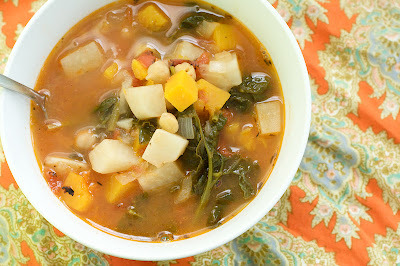 The result is a nice balance of savory flavors with a light sweetness from the squash and turnips. Of course, like most of my recipes, you can certainly customize this recipe to fit what’s in your refrigerator or CSA box. I’m sure I’ll be recreating this soup again in the coming weeks- and I can’t wait to find out what shows up in my bowl. In a large sauce pot, heat olive oil over medium heat. Add onion and cook until soft, 3-5 minutes. Add garlic and thyme; season with salt and pepper to taste. Next, add the squash, turnips, tomatoes and broth (use as much liquid as you see fit) and bring to a boil. Return the soup to a simmer and cook for about 20 minutes or until the squash and turnips are fork tender. Add the beans and spinach and let simmer another 5-10 minutes. 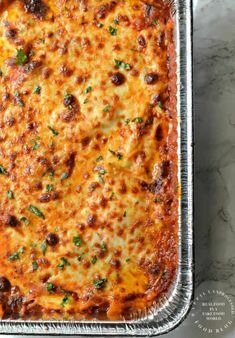 Serve hot with grated Parmesan cheese and crusty bread. Sounds delicious. 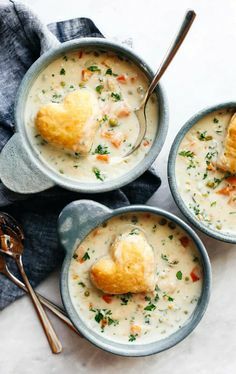 I now plan to make this as my soup for the week. Do you think this would be okay to freeze and then thaw and reheat at a later date? Such an awesome thing! I wish I had a local Hilton! 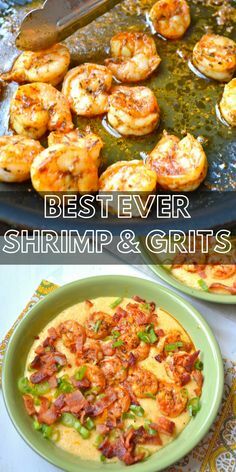 Easy Shrimp and Creamy Cheesy Grits! The ultimate southern meal! Cheesy grits, spicy shrimp, crispy bacon and fresh green onions make the ultimate comfort food! Click Natalie's photo to learn more.